(805) 781-8220 or email: office@oldmissionslo.org. If you live nearby but have not yet found a parish home, our doors are open to you. If you are seeking faith and meaning and have not yet found a church home, the Catholic tradition welcomes you and will prepare you for baptism or confirmation. Please contact us if you feel that you belong here. It is a strong sign that you do. Note: Our Ad pages are located in the bulletin. If you need Adobe Acrobat Reader to view bulletins you may download it free. J.S.Paluch Company, Inc. at 1 (800) 231-0805. Everything the Church hopes to share and accomplish is through some form of ministry. The Twelve Apostles set the first tradition of service and witness, and we are called to follow their example. Old Mission invites you to become part of its ministry of faithful sharing through attending mass, liturgies, and educational opportunities. I am not Catholic but would like learn more about the Catholic faith. It is not uncommon to lose a loved one unexpectedly. Such a loss is hard to prepare for. We are experienced in helping you through the practical and spiritual challenges of this time. We work closely with local mortuaries and funeral homes. The sooner you can contact Old Mission with news of the recent or imminent passing of a loved one, the better we will be able respond to your needs. Contact the parish office at (805) 781-8220. Certain funeral needs can be planned years in advance, from cemetery purchases and interment wishes, to service and liturgy planning. It is not uncommon for individuals to choose readings, songs and other liturgy elements for their own funeral mass or remembrance service. We have aides and counselors who can help you plan your own service or that of a loved one long before it may be needed. You may even wish to write you own obituary. Contact us if you would like help in planning for a future need. Call (805) 781-8220, Gayne Pinto Bennett at (805) 704-1373 or email office@oldmissionslo.org. 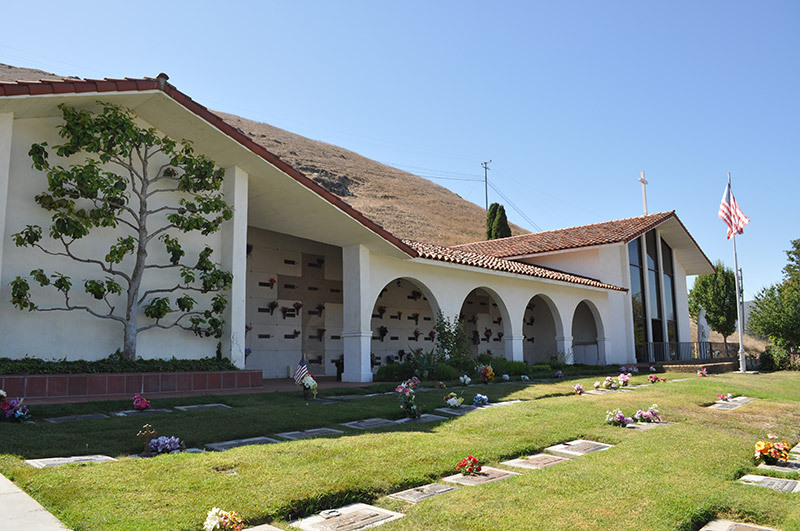 Old Mission Church supervises the Catholic cemetery, which you can enter on Bridge Street off Higuera. If you need help with a past purchase or wish to acquire a grave plot or niche in the mausoleum or columbarium, contact the Mission parish office. We are also available to help you locate the resting place of deceased family members or friends. A memorial mass is celebrated on the first Saturday of each month at 10:00 a.m. in the hilltop mausoleum.